Primitive Autumn Fall Hand Made Pumpkin Set of 3 Bowl Fillers. Love these for fall. I put mine out in an antique oval trencher bowl on our dining room table. I even mix mine in with the fall leaves bowl fillers as well! Size of each is approx. 5" x 2". 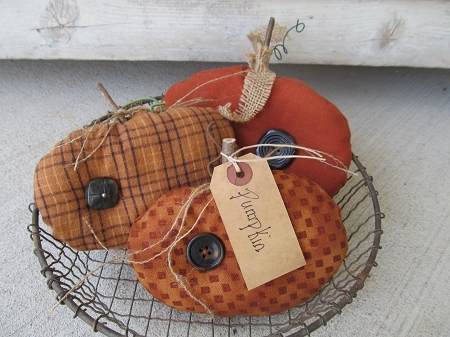 Set of 3 pumpkins with real twig, button and burlap accents. Set of 3 with fall primitive tag. Hand made by Lynn. Fabrics will vary slightly.